Tonight I took my Fruit Pizza recipe and tried a little twist with it… substituting the cookie crust with a brownie base. 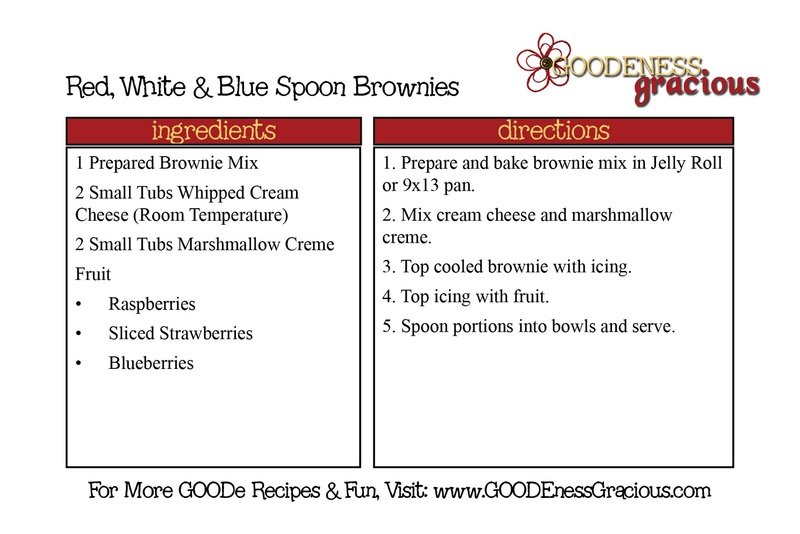 Truth be told, it turned out to be more of a spoon dessert vs. a pizza-esque concoction… so, I named it Red, White and Blue Spoon Brownies in honor of the holiday this weekend! Prepare as directed. I go ahead and do the low cholesterol version… I make up for it… don’t worry. I then spread out on a jelly roll pan with a spatula. You could just use a 9 x13 if you’d like. Or, these might be GOODe if you made the brownies in a muffin tin. Anyhoo… after baking to your desired done-ness, pull from the oven and cool. Meanwhile mix up 2 tubs of whipped cream cheese (at room temperature) and 2 small tubs marshmallow creme. I started out with one tub each, but it didn’t make enough for all my brownie GOODeNESS. Spread this bit of heaven on top of the cooled brownies. I DARE you not to eat some of it before the dish is done. I really don’t think it can be done… just sayin’. 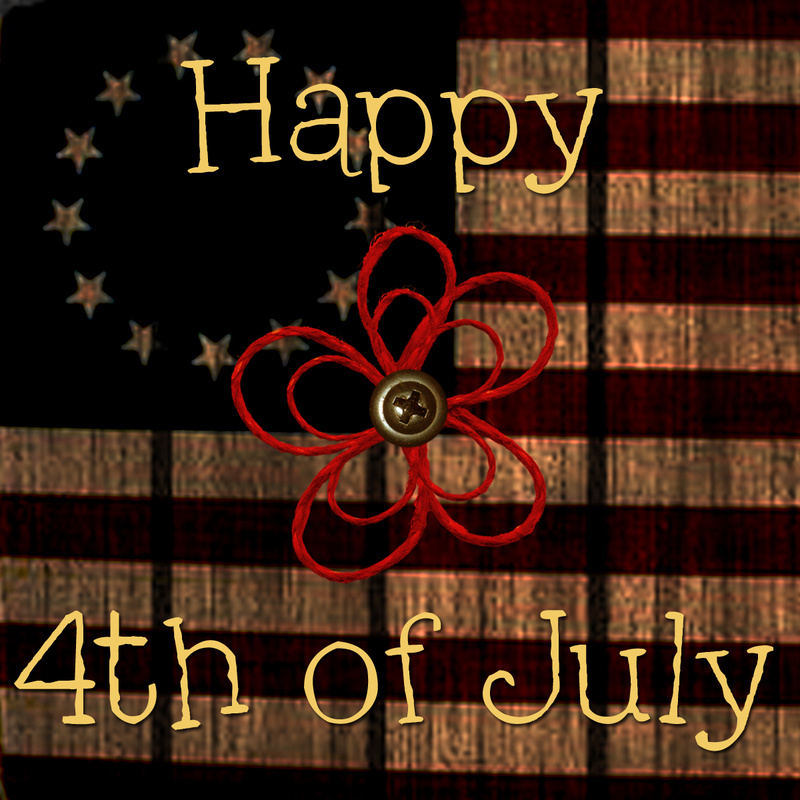 Now top with your fruit… in true patriotic fashion… Red, White and Blue. If I were making this again… on a non-holiday, I would consider just using raspberries. As I type this right now… every raspberry piece is now gone. The raspberries and chocolate go VERY well together. You could also make this into a trifle. Bake your brownies up. Then cut them up and layer brownie, icing then fruit and then repeat. Below is my recipe from tonight. Nope… not really at all. Perfect treat for a perfect night. Enjoy! On another note, thanks again for introducing me to the blogging world. I owe you and Leah big time. This looks sooooo yummy, Cris!! I can't wait to find the time to try out all these great blogging recipes I'm finding! Ooh fun twist on the fruit pizza…can't go wrong with a brownie under there! 🙂 Thanks for linking up today too.